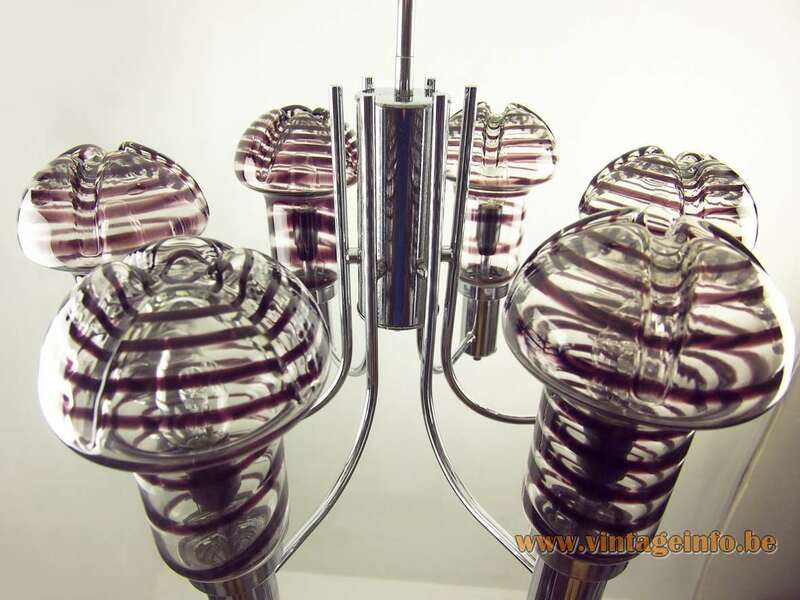 Materials: Metal chromed frame (iron) and 6 purple marbled and clear crystal hand-blown glass mushroom shaped diffusers. Bakelite sockets. 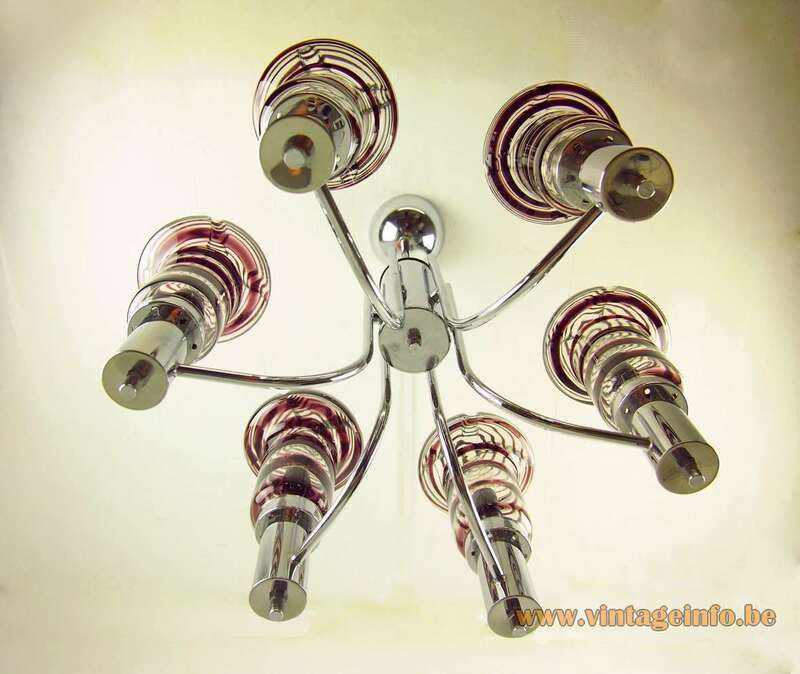 Electricity: 6 bulbs E14, 6 x 40 watt maximum, 110/220 volt. Designer: Angelo Brotto (1914 – 2002). Manufacturer: Esperia, Via Campania, 1D, 53036 Poggibonsi, Italy. Born in Venice, Italy in 1914, died in Campiglia Marittima, Italy in 2002. Angelo Brotto graduated on the art school of Venice in 1939 and already at that time he participated with his works in different exhibitions. Brotto graduated in 1941 on the Academy of Fine Arts in Venice distinguished himself by winning all competitions. He won many prizes for his outstanding works in the years that follow. In Italy his works have been acquired by the Gallery of Modern Art in Rome and Venice, by the Rivoltella Museum in Trieste, by the Venice Biennale, by the Ministry of National Education, by the Confederazione italiana professionisti ed artisti and by private galleries around the world. 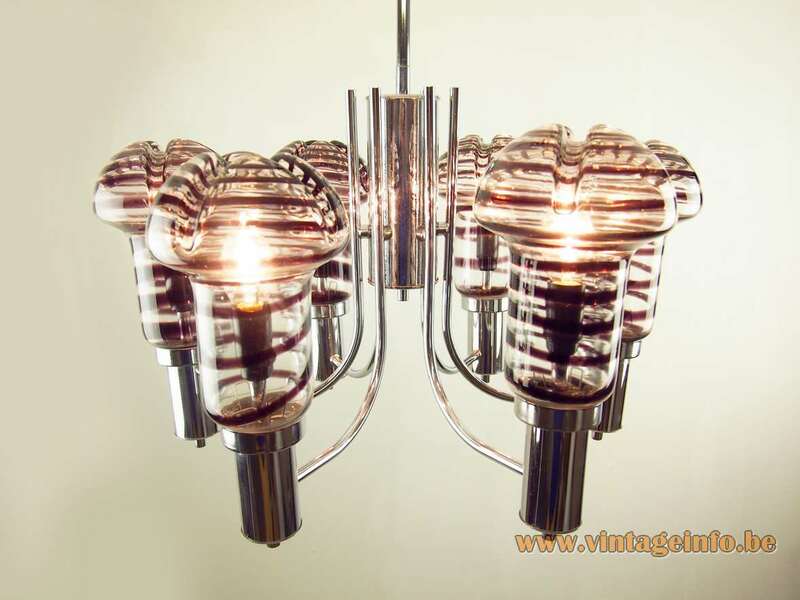 The Esperia company was founded in 1952, with the aim of producing chandeliers, table lamps, wall lamps, floor lamps, ceiling lights, wall light panels and furniture. Esperia is famous for the Quasar lamp from the 60s and 70s, designed by the Venetian designer/professor Angelo Brotto. 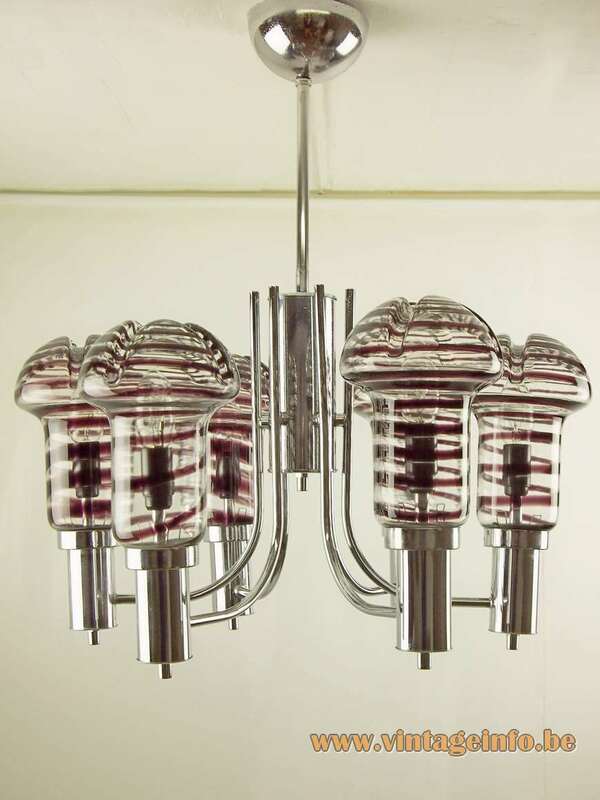 Brotto designed many beautiful lamps for Esperia in that period. 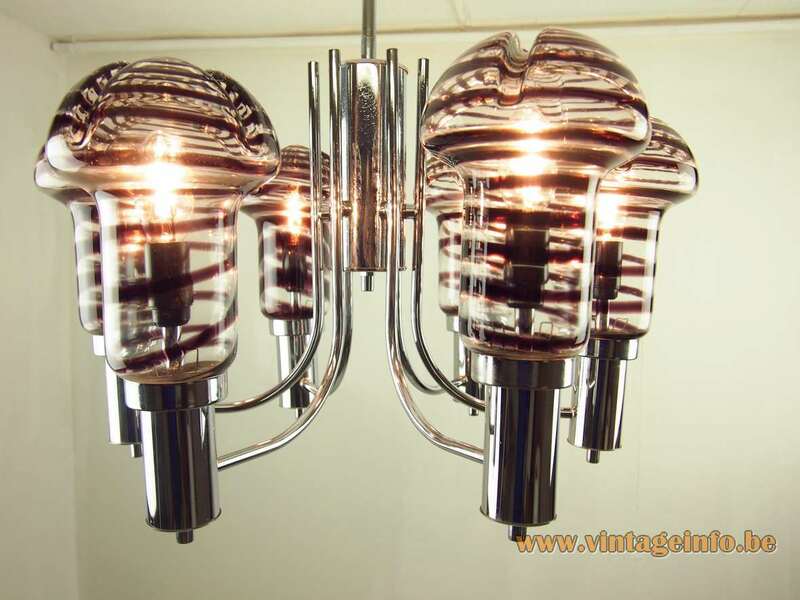 The Esperia company still exists and they produce very beautiful lighting. 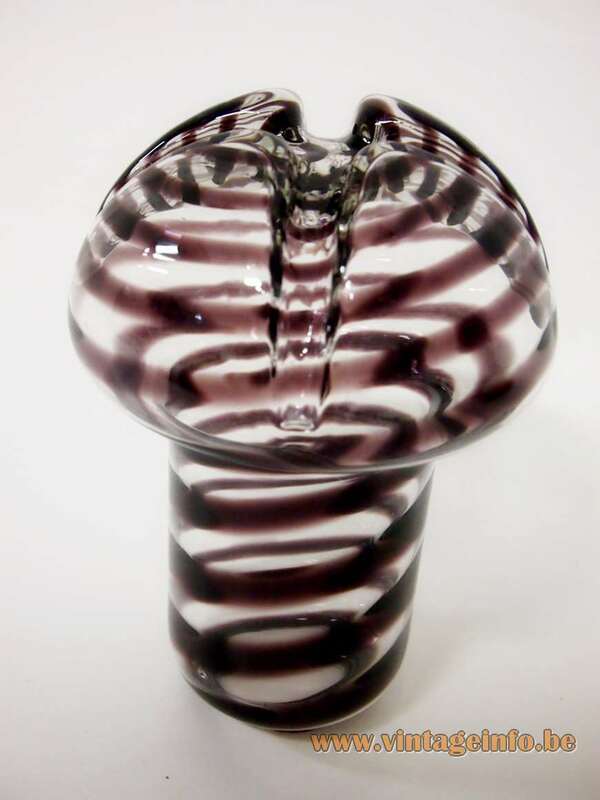 Murano glass artist Carlo Moretti used the marbled glass technique for many of his designs. Also Lino Tagliapietra made many glass objects for La Murrina in this style and Toni Zuccheri designed several items for Venini. In Florence, also in Italy you find similar designs for Empoli glass from the 1960s and 1970s.